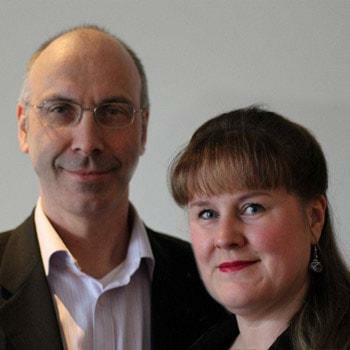 We are Johanna and Peter Lawrence and are proud to host the Sutton pin on the 2nd Thursday of each month at The Holiday Inn, Sutton, Surrey. We have been investing in property since 2008 and bought our first Buy-To-Let (BTL) investment properties whilst on Simon Zutshi's Mastermind programme. As a couple we are quite different with a shared interest in property and values of honesty and integrity in all we do. We also share a passion for music though we do not always agree in our tastes. About Peter: By nature I am an introvert so to help in overcoming this I joined the Wimbledon Speakers Club and am now Vice President - talk about pushing yourself out of your comfort zone! I would recommend a speakers club as a great way to increase confidence and improve speaking skills. By training and profession I am a chemist and still work in the chemical industry. Outside of property I am passionate about football though some may disagree as I am a lifelong Crystal Palace supporter. About Johanna: By nature I am an extrovert. I particularly love to help connect people. I currently work in a London corporate law firm in their support and marketing functions. I love to sing and in the not too distant past sang in a local choir with whom I competed at The Choir of the Year. My real love however is opera. I am also now a Crystal Palace fan (by default!) and know far too much about football to my sisters' chagrin! One of the reasons we wanted to get more involved with pin is that we have met some great people who have been fantastic in helping us achieve our goals. We wanted to help others the same way to experience the support and friendships that the pin family community enables. At the Sutton pin we intend to create a warm and friendly environment where people can learn and be supported to achieve whatever their dreams are in life whilst allowing property to help them do this. As hosts it is our role to facilitate you achieving what you need from the meetings so please come and talk to us about how we can be of help. At each meeting there will be a couple of experienced speakers sharing their knowledge to help you expand yours, whether you are beginning your property journey or are well on the way. During the course of the evening we will have breaks where you can chat with other attendees to help build relationships with each other. At pin meetings you will find a great mix of people from experienced investors to those starting out. You may well meet someone at our event who has the answer to a particular problem or question you've had, and this is the whole point of networking at Sutton pin, sharing knowledge, help and experience to facilitate an encouraging and warm environment. The meeting is only a few minutes' walk from Sutton Station which is 28 minutes from London Victoria. Alternatively, you could take the underground Northern Line to Morden Station. It's only a short bus ride to the top of Sutton. There is FREE parking available at the hotel for pin attendees. We hope you will join us at the Sutton pin launch on Thursday 12th March 2015 from 6.00 pm for registration - and thereafter on the 2nd Thursday of the month.